I briefly mentioned it in a post back at the beginning of September, and meant to write more in detail about it [and earlier] but… it just didn’t happen. Alhumdulillah [with the blessings of God], my parents and I will be heading for Hajj in a few short days inshallah [god willing]. Night of October 6th to be exact. The exact pilgrimage is for a few days in mid October, but we’ll be there for three weeks. May Allah SWT make it easy for us, and accept our Hajj [and all of our duas]. For my non-muslim friends: Hajj is the fifth pillar of Islam [for those who are able to physically and financially]. There are five basic acts in Islam [the Five Pillars] that are considered obligatory. Having faith: that there is only one God and Prophet Muhammad is his messenger. Prayer: it is required of all Muslims to pray five times daily, at various set times in the day. At dawn [Fajr], noon [Zuhr], mid-afternoon [Asr], sunset [Maghrib] and nightfall [Isha]. Zakat: charity. Basically, 2.5 percent of the accumulated assets from the last year are given as charity. Fasting: During the month of Ramadan, Muslims fast daily from sunrise to sunset. It’s not meant as deprivation. Rather, it reminds one [and helps gain empathy] for those that go hungry on a daily basis all throughout the world. It helps one with self-restraint and reminds you to feed your soul, not just your body. I think, it’s important to note, that there are exemptions — the ill and the elderly for example. It’s only compulsory for those who can physically do so. Islam is a very forgiving religion, and anyone who makes it to be otherwise is wrong. Hajj: a pilgrimage to Mecca (Makkah) [in the 12th month of the Islamic calendar] that every able [physically and financially] Muslim should make [at least] once in their lifetime. Note that the Islamic calendar works off a lunar calendar, so the twelfth month will vary. Rituals of Hajj in a nutshell: tawaf (walk counter-clockwise seven times around the Ka’aba), runs back and forth between the hills of Al-Safa and Al-Marwah, drinks from the Zamzam well, goes to Mount Arafat to pray, and then throws stones in a ritual Stoning of the Devil. Men pilgrims then shave their heads, and each pilgram sacrifices an animal. Once in ihram, after sunrise, pilgrims leave Mecca for the nearby town of Mena. In Mena, accomodations are in white tents. You stay in Mena for the duration of 5 prayers starting from the Zuhr prayers on the 8th day through the Fajr prayers on the 9th. this is essentially the most important day of the 5 days of hajj. After fajr prayers in Mena, leave for Arafat. Once you reach Arafat, there is pretty much one thing you should focus on: prayers and seek forgiveness. Pray Zuhr and Asr as a jamaat [congregation]. When the sunsets, move to Muzdalifah where you stay under the open sky until after Fajr (dawn) on the 10th. Pray Maghrib and Isha together in Muzdalifah at Isha time. Collect atleast 49 pebbles for Rami (stoning). There are three pillars and Rami consists of hitting them [7 times each]. On the first day (the 10th), you only hit one of the pillars and on day two and three [and sometimes day four] you hit all three pillars seven times each. This symbolizes how the devil challenged Prophet Ibrahim three times, and three times he refused. Each pillar marks the location of each one of these refusals. Animals are slaughtered/sacrificed to commemorate the story of Prophet Ibraham and Ismael. Perform the hajj tawaf (known as tawaf al-Ziyarat or al-Ifadah) before returning to Mena. Throw seven pebbles on each of three pillars. Perform the hajj tawaf if you didn’t on the 10th before returning to Mena for the night. You must perform the hajj tawaf (known as tawaf al-Ziyarat or Al-Ifadah if you haven’t already) before maghrib at the latest on this day. After today’s Rami, you have the option to return to Makkah before sunset. But if the sunsets before you are able to depart, you must remain in Mina for the third night and throw pebbles at all three pillars before departing. That basically ends the rituals of hajj in their most basic form. The only thing that remains is the Tawaf al-Wida (farewell tawaf) that is obligatory before you depart from Makkah for home. Hopefully when I am back at the end of the month, I’ll get a chance to reflect here about the experience while it is still fresh in my mind so I have it to look back on in the future. Not only that, but two other things I want to write about: clearing up misconceptions and what to take/pack with you! We have grown up hearing/believing so many things pertaining to hajj [and ihram specifically]. You wouldn’t believe how many are not true and have no basis/validity. Similarly – what to pack/take with you and what you actually NEED. I am no expert by any means, but I have very quickly picked up on some dos and don’ts for when dealing with those with a form of dementia and their families from recent encounters from my experience with Papa. These are my thoughts and thoughts alone! Not one of medical professionals, not my family members, just mine. Mine and mine alone. One. Don’t judge and say something ridiculous like: “I just talked to [your loved one] for a few minutes over the phone and it didn’t seem like there was anything wrong with him/her”. Thanks, I’m glad you came to that conclusion in the two minutes you spoke to him/her. How about being grateful, that alhumdulillah, there are still normal moments around. Just think for a second [or ask a direct relative if just pondering over it won’t be enough] what it feels like for an immediate family when [the loved one] cannot recognize them, or know where they are at the very least. We cherish those moments where everything seems right with the world, and those are the moments that get us through the difficult ones. So far in our case, alhumdulillah, most “days” run smoothly for the most part. It’s the evenings and nights that pose the challenge in more ways than one. Two. Yes, I understand what [your loved one] is saying doesn’t make sense sometimes. Deal with it, and let it go. Don’t remind him/her that s/he is wrong or correct them. Play along. Say nothing if you must, but please for the love of God don’t make [your loved one] think harder. Three. Don’t judge the family for what they say to [your loved one] to ease their mind. Chances are, no scratch that– I’M ABSOLUTELY POSITIVE there is a reason behind it and they know better. Four. If you are having a conversation with [your loved one], keep it simple. Enough said. They don’t need to know a whole life story that will probably confuse them later. And they certainly don’t need to be put through a [political/personal debate/argument]. Not necessary. Chances are some parts [or bits and pieces of many different conversations] will stick in their mind and come back later out of context. Not to mention that it’s not good for them to be over thinking either. Again: these are my thoughts, and thoughts alone about my experience. And they definitely don’t apply broadly to every person with dementia/Alzheimers/Sundowning Syndrome. Everyone copes differently. What works for me? Writing my thoughts and sharing experiences with my family who get it simply because they are experiencing it too. It’s not something that is easy to explain. Chances are you have heard of someone with Alzheimer’s, but until you experience it first-handed… it’s unimaginable. I don’t know if it makes sense or not, but my love/admiration for Papa has grown even more. I’m blessed immeasurably to have so many fond memories of/with him that I cling to on difficult days. I just came back on the 17th from Virginia after spending a week with him and unfortunately had several reminders to cherish the moment. That dementia/Alzheimer’s is ugly. I hate dementia with all my heart and soul, but love Papa with every ounce of me. P.S. Twelve days until my parents and I leave for a trip of a lifetime, inshallah… for hajj! More on that later. Family is family and there is nothing like family. One of the hardest things I have had to do in a very long time [if not ever] was to say goodbye and head back home hours away this past Tuesday night after spending a wonderful week by Papa’s side. There is no one better to take care of [your loved one] than a caring and loving family member. One who knows what they like and dislike, one who gets them, one who can comfort them and reason with them. Of course, it’s not easy. And everyone’s circumstances are different and you have to do what you have to do. But a stranger can never replace the level of care a family member can provide: because most of all, [your loved one] just wants some good old company. Someone to sit by their side and talk. Or do absolutely nothing. They need to be shown how much they mean to us, that they are loved, taken care of, and an important part of our life! I am blessed beyond words to have Papa in my life, and I loved every minute of the almost six days I had with him- the “Papa and me” time will always hold a special place in my heart. The last few days of my trip involved a lot of tears from my end, because I couldn’t imagine leaving him- what I wouldn’t do to be able to stay there longer by his side. My six days revolved completely around Papa, from the moment I woke up to the moment I fell asleep, so you can imagine who weird it felt to be back home and only speak to him via the phone. While you are busy planning for it, life happens. And you just learn to deal with it. Everything that can possibly go wrong, most likely will. Deal with it. Like the air conditioning deciding to stop working on us with about 80 people in the house on a hot/humid summer day in August. With the oven on constantly all day and burners under the chafing dish[es] running all day. Fun. Cherish the moment. You’ll never get it back. Because of Papa’s dementia, I have learned very quickly to just stop and savor the moment. As I was sitting with Papa last night , I realized to just sit there by his side and do absolutely nothing else… there is no where I’d rather be when I am lucky enough to have him nearby. Everything else can wait. Family first. Always. Nothing is more important. Period. There’s no one else that will always have your back. Eat healthy to live healthy. I found myself in a healthier eating habit I’d say almost a year and some change back and I can honestly say it makes a difference. Lately, often times I’ve not been home enough for meals or I’d eat something I normally wouldn’t… or eat late… and I can tell the difference. When you eat right, it helps you feel better inside and out. Just when you would like need the time to slow down a little is when it seems to speed up even more. Plus throw more chaos into a very hectic schedule already for more fun. If you don’t laugh about it, you’ll cry about it. Unfortunately, I have cried about it several times in the last few days. This, too, shall pass. For as long as I can remember, I have repeated this to myself on not-so-easy days/times. There are better days ahead. Glass is always half full. It could be oh so much worse. Life has been hectic, to say the least, lately. Anyhow, the night before a family party at our house at the end of August [a week and some change ago], I experimented with a semi-homemade seasoned chips at home. You know, because I didn’t have enough on my plate already. 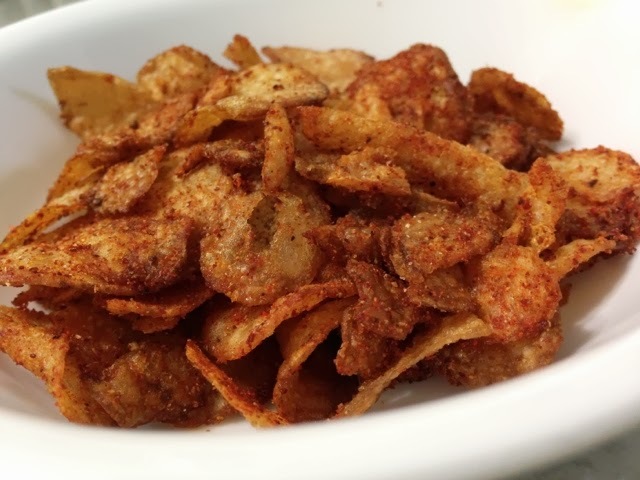 It’s semi-homemade because I took store-bought potato chips and made it my own by seasoning it with my seasonings. I had seen this combination online somewhere a few weeks prior, and I had immediately bookmarked it to try. Preheat your oven to 350 degrees. Line your baking sheet with a foil sheet. Spread [store-bought] chips on the lined baking tray. Put in the oven to heat for about 3-5 minutes. Just enough to warm them up. Meanwhile combine: 2 teaspoons each of chili powder and paprika, 1 teaspoon of ground mustard powder, cumin, garlic powder, and onion powder, and 1/2 a teaspoon of cayenne pepper. Immediately after taking the chips out of the oven, sprinkle your chips with the seasonings you just combined. It ended up being a perfect snack for our open-house style party too. The result is a smoky and delicious snack and definitely a must-try. So easy, and a great semi-homemade technique for sure! So good that I ended up making it two times over after making two large batches to begin with for the party! The seasoning combination should be perfect for a large bag of plain potato chips, so you can adjust accordingly to how much you are using. Last night, my brothers and I went to the US Open. It was my first live tennis match and I loved it! See, I know not to call it a game! We saw Nadal play against Kohlschreiber, and left before the second night match [a mens’ double]. The stadium, Arthur Ashe stadium, I believe is supposed to be the largest tennis stadium! The atmosphere was great, and thankfully the weather cooperated. It rained terribly all day and thunderstorms were forecasted for throughout the night. Luckily, it didn’t start to thunder until we were back home late night! It was a hectic, tiring, and a very busy weekend… otherwise it would have been nice to show up earlier and explore “the village” around the stadium. Sometime in the future, it would be great to come back, especially for a later round, to see a more exciting competitive game. I loved yesterday’s though and was actually rooting for Kohlschreiber – he played great the first two sets. Life is on the hectic side lately, that’s for sure. To top it off, I’m going to Virginia to spend some time with Papa mid next week and there’s just a few short weeks away until my parents and I leave for hajj, inshallah. More on that later. I can’t believe how fast time is passing by! So much to do, so very little time left! So many recipes to catch up on!! Things have been on the hectic side lately, and I’ve definitely slacked on staying updated on the recipes. It was a great weekend with the family [we invited a lot of family over yesterday], and I loved every minute of it. It’s a lot of work, and tiring… but so worth it. Tomorrow my brothers and I are going to the US Open. I have never seen a tennis match [see, I know not to call it a game!] live before so I’m definitely looking forward to it! But first things first, here’s the recipe for the Oven-Fried [bone in] chicken I made about two weeks ago. I had buttermilk sitting in the fridge because I had been wanting/meaning to make the cheddar bay biscuits… and just hadn’t. I rarely work with bone-in chicken, but used that when I made this a few weeks ago. I’ve also done a boneless chicken version of oven-fried chicken which you can see by clicking here. I love fried chicken as much as the next person, but can do without the oil. I try to make things I love with a healthier twist whenever I can. The trick to get it so crispy? The combination of the buttermilk marinade and the breading for sure. I seasoned the chicken with salt, pepper, paprika, garlic powder, ginger powder, and cayenne pepper. Add enough buttermilk soak all the chicken. Let it marinate for a few hours for tender meat. Preheat your oven to 400 degrees. Line your baking tray with foil or parchment paper [for easy clean-up]. Spray with non-stick cooking spray. Combine about 2 part flours to 1 part plain bread crumbs. Season with cayenne pepper. Bake for about 50 minutes in your preheat oven. The end result? 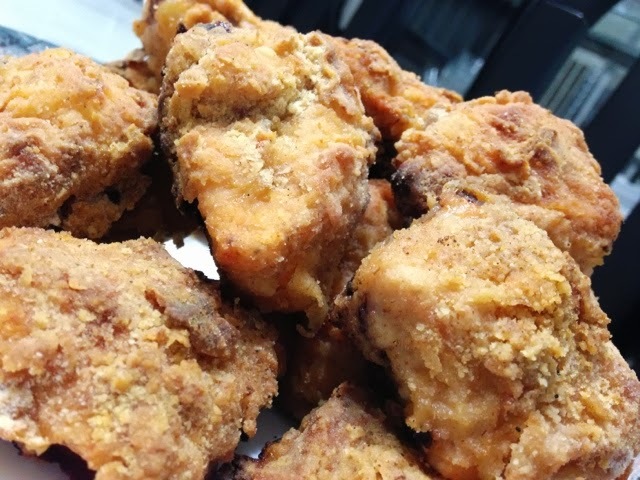 Moist inside, and the crispy crunch outside that we all love so much in fried chicken. Other recipes I have to post soon? Mango Ice Cream, Kulfi, Semi-homemade Seasoned chips. I *think* that will have me caught up.